This variable keeps track of the topic. The two banners at the top of the new primary image matching web page take up way too much of the screen real estate! Matching was much easier without this dead space at the top of the Google Earth display. 1. Does the staff at NASA working on the NASA Image Gateway project and the Image Detective planning on pulling and incorporating the information that CitiesAtNight has vetted and will be vetting as the work progresses? It would seem an invaluable resource that would greatly amplify the Image Detective work. 2. If the NASA staff had not planned to gather and incorporate those identifications from CitiesAtNight, then rather than just having the small limited pool of pick-a-photo the current Image Detective offers, can an Image Detective "bug" be added to every NASA Image Gateway page, such that an Image Detective can click that bug/web link, and have that image loaded into the Image Detective application? It would be just a small extra step on my and other volunteers part to call up and post the identification into the Image Detective app in addition to doing it in the CitiesAtNight app. It seems so unnecessarily limited to only offer 96 images to choose from at a time in the Image Detective app, given the 100,000s of images available. I personally geolocate between 10 and 20 NASA images per day just in my spare time on CitiesAtNight. A growing quantity of accurate identifications are being made for the NASA images, and it seems a tremendous loss for NASA to not tap what has already been identified. I personally do not care about points and top-scores and the like; I just want the identifications already made and continually being made to be as widely available as possible in NASA's own database. Is it possible to add a "I can't quite locate it button"? 25 Aug 2014 MoeZen raised the "uncle" button question and the NASA response was that the frame he is viewing had a wrong location. I am having problems with several photographs, I am being pointed at the correct area I am sure, but I just can't make the find! Examples: ISS005-E-14894 & ISS036-E-36037 in my queue. They just sit there and I can't find them! Considering ISS036-E-36-37, I have already identified 20 or more pics from that region, but I just can't locate this one, yet it hangs in on my queue. How about creating a "I can't get it button" that allows us to annotate with a comment about where we believe it is and allow users to get to it a take a shot. This would be very effective collaboration! ...and I agree with MoeZen, there should be higher point value for one of these "difficult" pics! Some of the photos are beautiful fractals (most difficult to locate them anyway because of the self-similarity) so my idea is to annotate these photos by a "fractal" label and later it would be possible to create "Geological fractals on Earth" collection of photos or database that might be interesting for the public and for the scientists too. I suggest that there be a way to indicate that I have no idea what an image is. In this way it is set to be removed from my queue. Thank you for adding pages to the set of images we can select. I was often running out with only five. And I notice you are now sorting the images by point value (I'm assuming the higher point images are more important to you), which is also nice. There are two further refinements that would be nice to have. 1) List the images from highest point value to lowest point value (the opposite of how they are listed now). That way it's easier to start with the most important ones. 2) Add a field so that we can jump to a particular page rather than having to use the left/right arrows. This will save us a fair amount of time. I think accuracy could be increased if it was possible to move the (center) point in the photos. Lining up the center points can be difficult. If there was a way to move the point in the photo, then specific geographic/geologic features could be used for pinpoint placement. In some instances the placement could be withing a few meters of the true position. Stargazer: completely separating image location from annotation of the visible features. This looks like a really good sophistication for our project in the longer term. Different sides of the brain! MoeZen: The image ISS036-E-16046 seems to have a wrong camera time in original metadata, a problem that occasionally occurs. But the image was subsequently cataloged (http://eol.jsc.nasa.gov/scripts/sseop/photo.pl?mission=ISS036&roll=E&frame=16046&QueryResultsFile=140908989470682.tsv ) and shows up as Memphis, TN airport. Sorry you had a bad experience with this frame! MoeZen: We'll look into it. Thanks. -- It certainly would be helpful to recreate the previous settings only ONE click away -- "do what I just did on the next image" button seems like just the kind of solution that a computer should be able to solve. We'll look into it. -- recurring to the last pick page looked at ought also to be doable. Thanks for the inputs, CDR. LegenDaryl and image rotation: We understand the problem. We'll look into changing this, but may have to live with it. LegenDaryl: Good suggestion that other users have made. We're looking into it. Would it be possible to have a button that would let us give-up on a photo? For lack of a better term, it could be called the "Uncle" button. Maybe by saying "uncle" the point value could be increased and the photo could either be passed to another user, or put in a public queue where any user would have to chance to identify the location. Photo ISSO36-E-16046 drove me nuts for, sadly, about 4 hours (cumulatively over a few days). I don't give-up on puzzles, but even grid-type searches, of a very large area, didn't work. Now I'm curious! 2) pull up the next available image. Bonus points if it would also rotate and zoom the next image to the same degree as the previous (submitted) one. Astronauts seem to like to snap several images of the same thing in quick succession and it would save a lot of clicking. Currently after submitting an image I choose pick image-> click to the page containing the image I want (say it's page 5) -> click the image -> hide the image -> zoom the map and scroll to the correct location -> show the image -> click the rotate button several times -> resize the image -> choose cloud cover -> type features -> click submit. That's probably 20+ clicks for an image that is nearly identical to the last one. This would also make my results more standardized. For example, we currently have about 12 images of Greece that are nearly the same. Because they were taken at an angle, they were pretty foreshortened. I had difficulty knowing how much to zoom and rotate because of distortion so the amount of each I did was probably wildly variable between images. Barring a magic "do what I just did on the next image" button, it would make things easier to be able to type in the amount of rotation we want. If I know I rotated the last image 117 degrees it would save me a few clicks to just enter that number for the next image. Otherwise I need to click +45 +45 +45 (change to 5s) -5 -5 -5 (change to 1s) -1 -1 -1. A way to enter which of the 5 pages of images we want would also be appreciated. Or have the pick image screen popup to the last page we chose from instead of automatically returning to the first page. Or have the pick image page arrows wrap around so we can get to page 5 from page 1 by clicking the left arrow instead of clicking right arrow 4x. It's not a huge deal if these things can't be implemented (it's not like we're on production pay or anything), but when faced with 10 or more nearly identical images, it's a little discouraging knowing you'll have to start at zero for each one (200+ clicks). I think people who don't have much time to spare or who are more casual would be put off from starting a bunch of pictures of the same thing or would start them but get bored and quit in the middle. The rotation of the image could work better. The rotation cuts off the corners of the image because the rotation window does not rotate with the image. For images that are almost the same, it would be great to have a button that starts the next image in the same location as the last image, to make it quicker. CMDRSHEPARD: Great feedback, thank you. The Pick List is updated once the images have been identified and submitted for approval by any user. Once the images are identified, new images come in to replace the existing images. As for seeing the same images in the Pick List: it is very likely that you did not improperly locate the image. We typically have access to review new imagery that our Image Detectives submit the day after you submit them. Therefore, in the mean time, they may show up in your Pick List until we have had the chance to approve them. We have recently been notified of an issue that images a user has already identified do not show up as "grayed out", or unavailable to re-identify. That issue is currently being fixed. Thank you for all of your feedback. We will plan on creating a PDF version of the tutorial so users may have that asset as well. klipsch49er: We can understand how that could be frustrating. We will look into giving user scores on the main Image Detective submission screen. tallbob29: Thank you for identifying the issue of images not graying out after you have identified them. We are currently working on the issue, and it should be fixed shortly. How about adding a way for users to "opt in" to show their email addresses. Or make a true forum board, where registered users can post and respond to other users. I could see this becoming like other forum boards. I found my way here a few days ago from the CNN article and am really enjoying seeing all of the amazing photos. Can you tell me how often the available images are changed? Is it done for each detective or are they generally available for a set period or until a certain number of people have identified them? The first couple of days it seemed like they turned over daily, but now I feel I'm seeing many I've already completed. I'm not sure if they're still available to me because I didn't do them properly the first time and I should do them again or if I should wait for new ones to appear. Thanks for making an easy to use interface. The tutorial was a good length (not too long) and straightforward. For some reason I was expecting narration but it's not necessary. A downloadable PDF might be used by some. You might want to add a tip sheet on how to approach foreshortened images. I find it hard to decide how much to zoom. It would be nice if you put a post (maybe in the General topic, or in a FAQ topic) that explained what happens to these images once we submit them. It would be interesting to know the remainder of the process that goes on and where they end up. It would be nice if, when I start a new session, the images that I've submitted in previous sessions are not presented to me on the "Pick an Image" pages. For example, today, when I logged in, about 4 of the 5 pages contained images that I'd submitted yesterday (or the day before), and only about 10 new images. It would be nice, on the 5 "Pick an Image" pages, if the text for images I've already submitted stayed "grayed out" for my entire session. At present, when I submit images, the text stays grayed out for a while, but then goes back to white. Bottom line: The text color (gray or white) is not a reliable indication of whether I've submitted the image already, or not. So I must keep track separately. I believe having the ability to see your own score is important. Frankly, I have submitted several items and have not been able to find myself on the score chart. How do I know my submissions are counting for something? geoDude55: Another good suggestion, but one that might require a little more work and take some time to implement. We will certainly look into it as an alternative, as it does sound very user-friendly. doylesangel: That is a great suggestion. We will do what we can to incorporate user points onto the main Image Detective cataloging screen. geoDude55: Thank you for your feedback! We have added the sun azimuth angle to Image Detective for user convenience. This angle is the clockwise angle in degrees from north to the sun, and as geoDude55 mentioned, this should aid in rotating the astronaut image when locating the center point. geo-positioning the pictures can become easier: let us mark 2 far apart points on the picture, and their corresponding points on the map. Render the picture joining the corresponding points. Extra enhancement: adjust the projection of the map according to the point of view of the spacecraft. Google Earth can do that. Please add to the photograph info the direction of the sun in degrees relative to north and zenith (degrees N/S and E/W relative to zenith is also possible). I just saw clear shadows on a "difficult" to spot picture of mountains. With the direction of the sun, I can rotate the picture to fit the shadows with the direction of the sun.I guess you NASA girls and guys don't have to be told, that the sundirection can be calculated from the date and time the photograph was taken and the spacecraft suborbital point. Is the training video too long to any one? Would include a text version of the steps which can be printed be helpful? 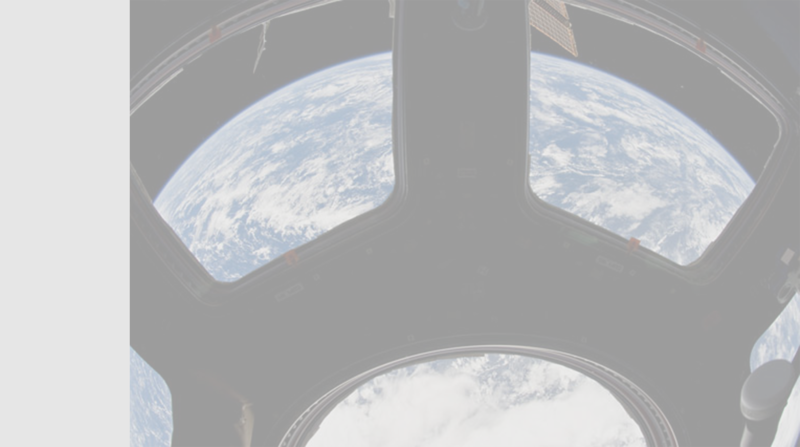 I think it would be interesting to pick or submit a request for our own selected images that we want to locate from the uncatalogued images on the Gateway to Astronaut Photography of Earth website. Does anyone else think they would like to be able to pick some images for themselves to locate? To add content, log in to the Image Detective system after your detective name has been approved. Submissions are posted after they have been screened. Display the form to add an entry if logged in.